Apparently an important issue facing the Republican candidate for President is Golf Gear. 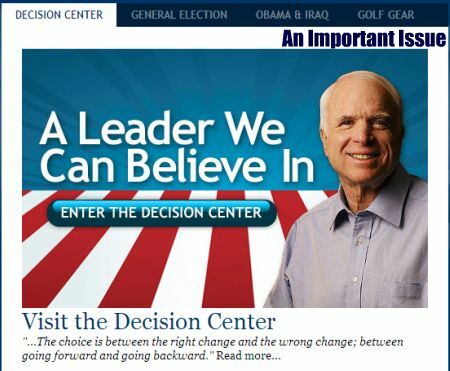 As you can see from this screenshot taken from John McCain’s website emphasis is placed on Decision Center, General Election, Obama & Iraq and GOLF GEAR. Now I understand that McCain is a senior citizen and that he is from Arizona and that he is a Republican and that golf appeals to members of all three groups. The Golf Gear issue is not going to assist in getting the votes of young voters, minority voters or Hillary fans. I am not a Republican but I lived in Arizona for ten years and I have golf experience. But I wasn’t golfing, I was working at a snackbar. My first job, during the summer when I was 12 and 13, was at the Snack Shack, at a golf course in New Hampshire. My primary duties were selling hot dogs and sodas and dealing with assholes. I have had a lot of crappy jobs. In fact, I am the queen of crappy jobs. I have cleaned hotel rooms, answered phones for a cab company, and worked in tech support. But golfers are the nastiest, most condescending pricks I have ever dealt with. One day it was 95 degrees and sweat was dripping off of me while I cooked hot dogs over a gas grill. A group of golfers came into the snack bar and one of them asked, “Are the hot dogs hot?” Are the hot dogs hot? Are you freaking kidding me. Barack Obama is the Nintendo Wii. He stands for change … something different … almost a revolution. A large part of the Wii’s success has been games that have very simple concepts but yet done in a way that has not been seen before. 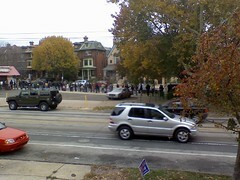 Obama’s message is of hope and change – simple concepts that we have not seen in politics in a very long time. And although he is currently popular with a variety of demographics it is unknown as to whether his popularity is a passing fad or will have staying power. And as the Wii is the not the powerhouse of consoles and does not have cutting-edge graphics, Obama is inexperienced and it is difficult to determine how he will hold up. In the Wii’s favor is that Miyamoto is no Reverend Wright.